Your Items list in SalesIn can be kept up to date on iPads and iPhones, as well as the Web Portal. If you are integrating SalesIn with your accounting system, we link in with products, their prices, categories, images and anything else that we can find. 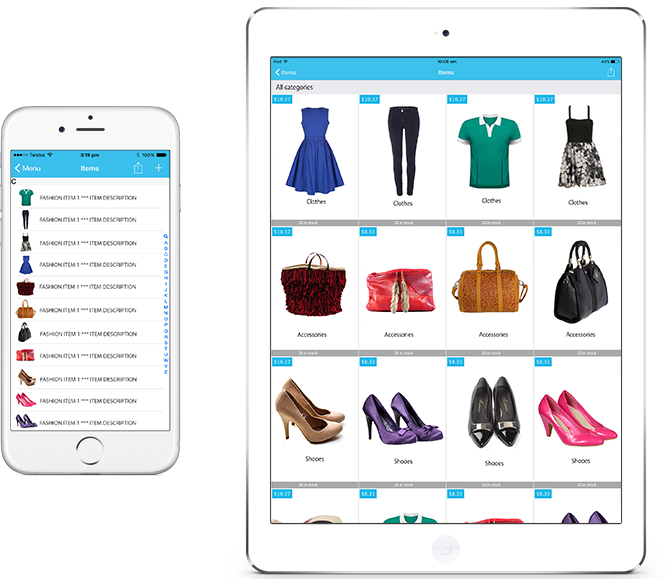 Easily classify your items into categories for quicker searching and browsing. You can apply discounts based on category, and even hide categories from certain reps and/or customers. Your category structure is hierarchical and you can have unlimited categories and unlimited levels. Assign one or more images to your items and watch your item list shine! Using images with your items not only makes it more enjoyable to look at and use, it can help your customers identify the exact product they are after. JobSync gives you support for unlimited product images. Your reps can view an item on their iPad and see its real time stock level as it changes throughout the day with other reps and purchases. Out of stock warnings can be shown to users during a sale, keeping them informed to make the right ordering decisions at the time of sale. If you are subscribed to the Professional or Complete plan, you will enjoy the benefits of multi location support. There’s loads more features than just these – the best way to find out more is really to take it for a spin. Grab your free 14 day trial now and get started! This feature is only available on the Professional or Complete plan. If you are operating a multi warehouse business, rest assured that SalesIn has inbuilt support for an unlimited number of stock locations. 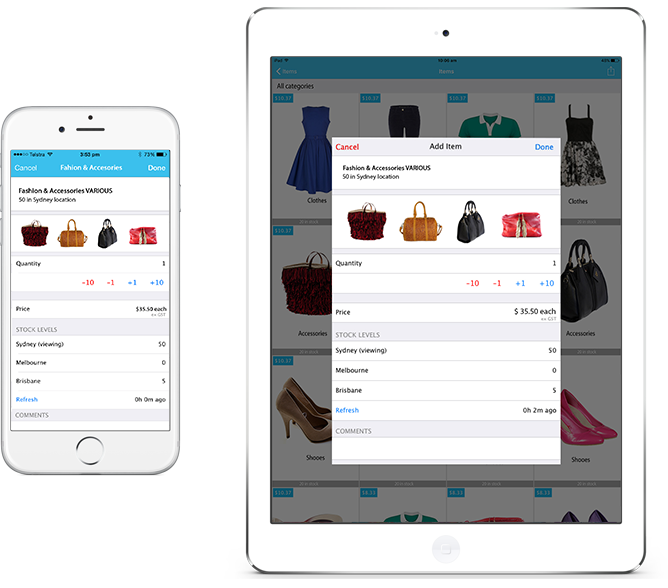 This enables you to define the stock on hand per item, per location as well as track every movement you can think of. Further control exists to only allow sales reps to see specified locations, and you can even assign a default stock location for customers if you want to. Prices can even be different for the same item when sold from a different stock location if you’d like. If you need to transfer stock from one location to another – for example loading up your vans with goods from the warehouse each morning – our stock transfer tool will make this a breeze, automatically reducing stock from the source location, and increasing it in the destination location. Please note that support for stock across multiple stock locations only available on the Professional or Complete plan. 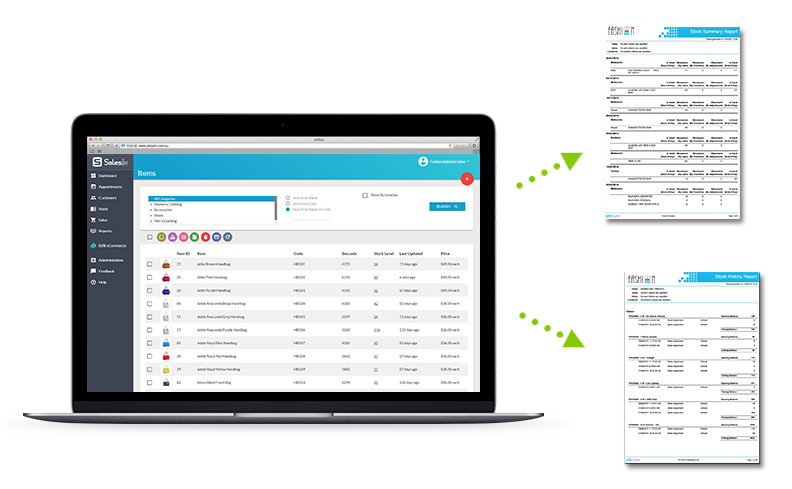 When it comes to doing a stocktake, SalesIn can make life a bit easier for you. Easily begin a stocktake and add items to it, setting their quantity on hand. You can even grab a compatible barcode scanner to scan in your items. Once committed, the stock levels will be adjusted – easy as that. The SalesIn web portal provides an insight into inventory movements for managers, as well as detailed reporting on a transactional level for individual stock tracking. Easily generate a report and see what was sold, returned, transferred and adjusted, within a date range, by customer and user. Use the web portal to browse your items list and view real time stock levels, per stock location, as well as maintain your item details such as pricing, images and taxes. Take a closer look. No credit card required.